I made this hidden design cake for my daughter, LJ’s, birthday as she loves homemade cakes and each year I am tasked with thinking of a new cake! 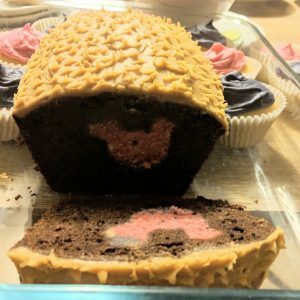 She is a huge Disney fan and her boyfriend booked them a holiday to Disney Land Paris for her present, so I decided to use a Mickey Mouse shape in the cake. Add the eggs, one at a time. Mix well. Put one third of the batter into a separate bowl and add desired food colour. Put the batter into a loaf tin and bake in the centre of the oven for 20 minutes (until cooked through). Meanwhile, sieve cocoa powder (if using) into the larger batter. 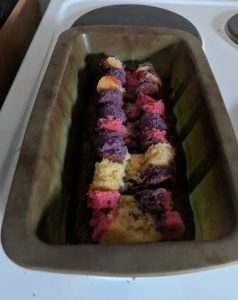 Once the coloured cake is baked, remove from the tin and leave to cool. 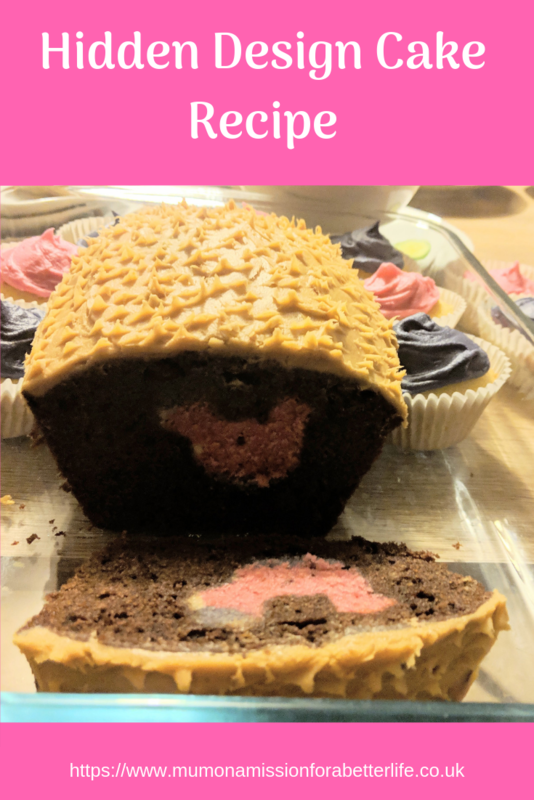 Use a cutter in any shape to cut shapes from the coloured cake. Put some of the cake batter into a loaf tin and then line the cake shapes along the loaf tin. The batter acts as glue to keep the cake shapes up right. Then pour the rest of the batter over the cake shapes. Gently tap the tin to get rid of any air bubbles and then bake for around 40 minutes. Once cooked and cooled you can ice and decorate as you like. When you slice the cake open you should be able to see the shape of your coloured cake inside. I made a multi-coloured cake and cut out Mickey Mouse heads using a cookie cutter which I got from Ebay. I flavoured the surrounding cake with cocoa powder and then I iced the cake with salted caramel icing. However, I used a silicone loaf tin which I think was a mistake. The sides are so flexible, they expanded and made the head shapes move so they were not centered. Therefore I would recommend using a solid tin. Overall, I was happy with the finished cake and everyone enjoyed eating it!